Pediatric dentists have 2-3 years of additional specialized dental training to keep children’s needs in mind. Our pediatric dental offices offer everything a normal pediatric dentist does – x-rays, cleanings, dental surgeries if necessary – all on a child’s level. Our pediatric dentists in Waltham, MA, can alert you to ways to help your child avoid the tooth decay that can lead to painful cavities. Plus we continue to treat children’s teeth as they mature through their teen years. When Should Your Child See Our Pediatric Dentists In Waltham, MA or Wayland, MA? One of the first questions most parents have when it comes to bringing their child to a pediatric dentist is, does it cost more? Bringing your child to see our pediatric dentists in Waltham, MA, typically does not cost you any more money than if you brought them to a general pediatric dentist. In fact, you will most likely save money over the long term, because proper dental care today helps to avoid cavities and other problems tomorrow. Our Wow Dental Group pediatric dentists ensure that your child’s first dental visit is a relaxing, enjoyable event for you and your child. Our patients and their parents find that they love coming to see our pediatric dentists because they get more specialized dental care and the experience that is needed when working with youngsters. 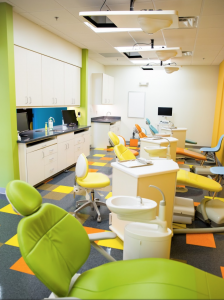 Our pediatric dental offices in Waltham, MA, specialize so completely in pediatric dentistry, in fact, that 100% of our dental clients are children and teens. That’s right – our dental offices are completely focused on your child’s comfort and needs. Our pediatric dentists and dental team love to help their young patients develop a lifetime of healthy dental habits. Start Your Child’s Dental Health Journey Today! By bringing your child to see one of our pediatric dentists in Waltham, MA, you will get your child off to a great start. This will help provide them with oral health habits and benefits that will last a lifetime. To start your child’s dental health journey, schedule their free, no-obligation Wow Smile Assessment. To request your appointment today, call one of our children’s dental offices in Waltham, MA. To use our easy online request form, click here. Join the 30,000 happy smiles transformed since 2003 and experience Wow Dental Group! You will see our pediatric dentists in Waltham, MA, offer quality dental care for children in Waltham, Wayland, Marlborough, Sudbury, Hudson, Framingham, Lexington, Belmont, Northborough and Southborough, MA. We look forward to hearing from you!